Information about buying, selling and investing in residential real estate. Copyright © 2017 Alliance Engineering, Ltd., All rights reserved. One of the most important factors in designing a new single home or in developing out an entire neighborhood after platting is the cost per square foot of the home or Project to be built. Denver, Colorado is presently the fastest growing economy in the U.S and, thus, there is presently almost unlimited demand for homes of all types and sizes. As a result it is important to carefully consider the likely price per square foot of the construction of a new home as opposed to that of an existing home. Alliance has carefully studied the housing market and specifically those homes that are considered typical for a medium-high end custom home and are neither considered overly luxurious, nor economy homes. This information is being made available to the public for general use in qualifying budgets and design programs. Typically, there are three (3) ways to measure square footage. This is important because it is a highly sensitive variable. The first is measuring only finished living space and not accounting for unfinished space or garages. The second is measuring total enclosed space, not including garages. The third is measuring total enclosed space including garages. When starting a project, make sure you clearly identify how you are measuring space in your program and that you are using a common standard of measurement with your engineer, architect, and/or contractor. The costs noted below are for the construction of the finished home itself with all accessory appurtenant structures (decks, covered porches, and the like). It DOES NOT include land costs, site development costs, soft costs or finance costs. It does include all interior finishes. However, it does not include furnishings, art or interior decorating for the home. Low: $150 per Sq.Ft. / High: $275 per Sq.Ft. / Average: $235 per Sq.Ft. / Median: $230 per Sq.Ft. Low: $150 per Sq.Ft. / High: $230 per Sq.Ft. / Average: $195 per Sq.Ft. / Median: $185 per Sq.Ft. Low: $125 per Sq.Ft. / High: $195 per Sq.Ft. / Average: $165 per Sq.Ft. / Median: $155 per Sq.Ft. The breakdown of these costs by percentage of construction component is shown below. This is a generalized model based on the Denver housing data. As each project can vary significantly in one or more categories, a Schematic Design needs to be developed in order to allow for line-item budgeting to further inform the homeowner of the actual costs and breakdowns for the Project. Although these may seem high, that is the way it is in Denver, Colorado right now. When the time between listings of existing homes going onto the market and initial contract offers is not days, but hours, it is no wonder that new home pricing is as high as it is. The Colorado Principal office is located in Westminster, Colorado. We have licensed Professional Engineers (“P.E.’s”) available on call to complete inspections and reports within 24 to 48 hours of the call coming in. Please call us at (303) 485-8700 or (720) 898-0660. You can also contact AEL by email at mcentofanti@AELEngineering.com. We oftentimes have to react instantaneously and are used to doing so due to an upcoming closing or contract. I live, work & volunteer in Englewood and love this city. If you’re interested in looking at homes here, please give me a call, text or email, I’d love to show you all the great things about Englewood. If you’re interested in buying a home in Englewood, I’d love to help you. I live, work and volunteer in this wonderful city. Contact Judy if you’d like to talk about finding your new home! 10 important tips for Sellers when showing their home. Be as flexible as possible with showing times. Evenings and weekends are the most popular times for buyers to view houses. Your home won’t sell if buyers can’t see it. Open Houses are important, especially in this current market. An open house allows your home to be viewed by as many people s possible, with minimal disruption to you and your schedule. My suggestion is that you plan on going on a nice weekend get-a-way and let me do the work! Have plans for your pets during showings. Some people are uncomfortable around animals. You’ll need to put dogs into crates, take them to doggie day care or ask friends or neighbors to care for them. Cats that cannot go outdoors should be placed in carriers. Most people are conscientious, but they cannot guarantee your pet won’t escape during a showing. Your pets are your responsibility. Put valuable items in a secure location. Most people are trustworthy but it is best not to leave valuable items in plain view (i.e. jewelry, money, collectibles, and personal electronics). Secure all prescription drugs. This is critically important, especially during an open house. Although your agent will be present for the open house, it is difficult to keep track of everyone at all times. Keep your house as clean as possible. Have a closet, bin or other convenient location to hide things if you need to make a quick exit. Do your best to have your home ‘show ready’ at all times. Don’t stay in your home during showings or an open house. It is very important that buyers have the time and freedom to thoroughly view your home. Most buyers are not comfortable if the seller is present. If you cannot leave consider going outside, go for a walk, or visit a neighbor’s house. It is okay to wait to leave for a showing until the buyers arrive. I suggest you check after about 30 minutes to see if they’ve gone and you’re free to go back inside your home. It is to your benefit not to stay in the home during showings. Be careful about talking to the buyers or the buyer’s agent. It is too easy to give away information to the buyer or their agent that could negatively affect you during negotiations. “Silence is Golden”. Call your agent immediately if you find any problems in your home after a showing or open house. If you live in the Denver Metro area and are thinking of selling your home. I would be honored to help you. You can reach me through the “contact me” link on this website. Buy only what you can afford with the salary you are making RIGHT NOW. Don’t count on a promotion, a raise or a new job. In most cases, especially with first time home buyers, your income will increase, not decrease. If you buy a home you can afford today you can weather any volatility in the the real estate market. The market value of your home only matters when you SELL. Although no one can predict the future, if you plan to stay in your home for 5 – 7 years you can very likely wait out any downturn in the market. Looking at historical data if you purchased your home at the peak in 2006, the Denver Market had essentially recovered by 2013 (7 years). Prior to that the property values had been increasing steadily since 1992! (S & P, Case-Shiller Home Price Index). S&P Dow Jones Indices LLC, S&P/Case-Shiller CO-Denver Home Price Index© [DNXRSA], retrieved from FRED, Federal Reserve Bank of St. Louis; https://fred.stlouisfed.org/series/DNXRSA, June 6, 2017. Interest rates are incredibly low right now and the likelihood of them increasing gets a little greater every day. 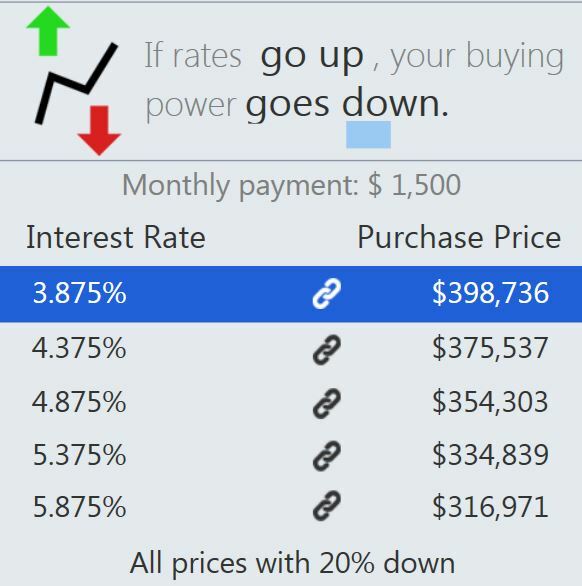 For every increase in interest rates you reduce your buying power. For example: if you want to keep your principle and interest payment around $1500 and you have 20% down, the graphic below shows you how that affects your buying power. With all that being said… If you’ve been sitting on the fence, wondering if you want to buy or not, please reach out to me. I will help you logically evaluate your unique situation so you can make an informed decision about whether or not you’re ready to buy.